A £402,000 refurbishment of the Theatre Royal & Royal Concert Hall (TRCH) box office and entrance foyer is underway in Nottingham thanks to local contractors, Robert Woodhead Limited, Architects Marsh Grochowski, Services Consultants HC M&E and Focus Consultants. The transformation will see the original box office stripped back in order to make way for a brand new installation, as well as a new merchandise kiosk and terrace upgrade. The electrics to the foyer kiosk are also being upgraded, as well as new lighting added in to the terrace. 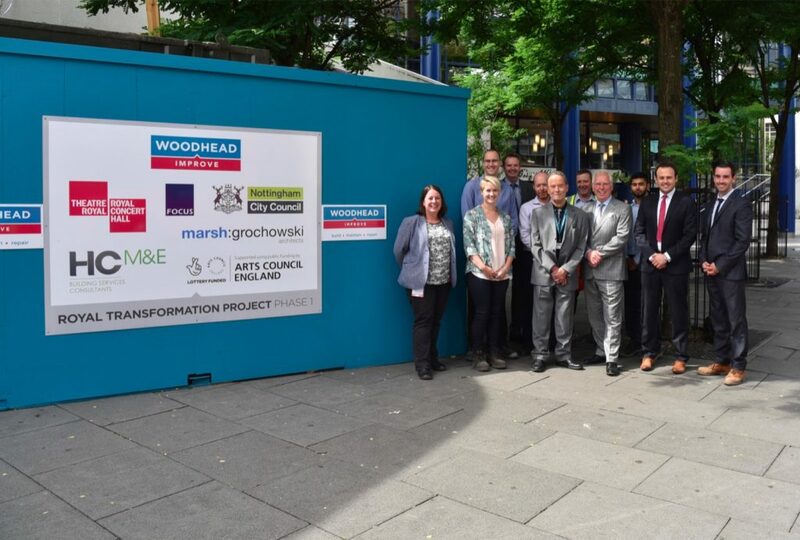 Woodhead Improve, the company’s specialist refurbishment team, is working closely with the project management team at TRCH and Nottingham City Council to make sure there is as little disruption as possible to the day to day operations of these popular venues during the building works. Woodhead Director, Derek McGrath, said: “We’re delighted to be working on such a project in the heart of the city. It’s key while working on a site like this that we manage the works with the client’s needs in mind at all times. They need to continue normal daily operations while we are working with them, so we have devised a scheme of works which will cause minimal disruption while delivering as efficient a programme as possible. With over half a million visitors every year, the Theatre Royal and Royal Concert Hall are two of the UK’s most successful touring venues, leading the way for arts and entertainment in the East Midlands. The work is part of Nottingham City Council’s commitment to maintaining and ever improving these fantastic venues, and while work is underway all shows will still go on. Work began on site on 23rd July and is to be completed by mid-September. Focus Consultants has been working alongside Woodhead Improve to deliver the project management and quantity surveying on site. Joanne Hardwicke of Focus Consultants added: “This is a fantastic project to be a part of as collectively we change the look of this iconic building used by so many Nottingham people and hundreds of thousands of visitors to the city. The project is jointly funded by Arts Council England and TRCH.